GPS tracking watches are becoming extremely popular among runners and other serious athletes. 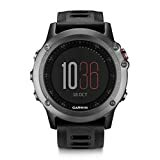 If you're looking for something that goes beyond a basic run tracker, Garmin﻿﻿﻿﻿ Fenix 3 (Amazon) and Suunto Ambit3 ﻿﻿Peak﻿﻿ (Amazon) are both great options. Whether you're competing in triathlons or ultramarathons, these devices have you covered. Read on for a review and comparison of the Garmin Fenix 3 vs Suunto Ambit3 Peak. Both sport watches offer exciting features and great functionality. Here, we have briefly summarized each watch and the most notable pros and cons of each. Read on for specific details about each watch. Both the Garmin Fenix 3 and the Suunto﻿﻿ Ambit3 Peak are excellent choices for multi-sport tracking, and both offer many exciting features. In fact, these two watches share several features in common. To start off, both watches offer GPS tracking. You will be able to track your runs or other activities and view your stats right on the watch. You can also view run details, including a map, using either watch's matching phone app. Both watches offer multi-sport tracking, with the most common activities including running, cycling, and swimming - in other words, these watches are great for triathlons and other competitive sporting events. These two sport watches have several other features in common including weather, navigation and backtracking, compass, and a barometric altimeter. Overall, both watches are a great option for tracking any sport. As discussed above, these two sport watches have many features in common. However, there are also some notable differences. One main difference is the screen resolution. The Fenix 3 offers a resolution of 218 x 218 pixels, making for a beautiful display that is easy to read in the sunlight. On the other hand, the Ambit3﻿﻿ Peak has a resolution of only 128 x 128 pixels, which can appear grainy and may be difficult to read outdoors. When it comes to battery life, the Ambit3 Peak has the advantage. While the Fenix 3 boasts up to 20 hours of life in GPS mode or 50 hours of use in its "UltraTrac" mode, the Ambit3﻿﻿ Peak allows for an amazing 200 hours of life in it's most conservative GPS mode. If long battery life is important to you, t﻿﻿he ﻿﻿Ambit3﻿﻿ ﻿﻿Peak is the clear winner. While both watches allow some feature use on the watch itself, the ﻿﻿Fenix﻿﻿ 3 is a bit more user-friendly. In order to use some features on the Ambit3 Peak, the user will need to go into the connected phone app. If you want everything to be accessible from your sports watch itself, the Fenix 3 has a leg up here. Finally, when it comes to connectivity, the Fenix 3 supports both wifi and Bluetooth, as well as USB. The Ambit3 Peak supports only Bluetooth or USB connectivity. Both watches can be connected to either a phone or computer. As you can see, when it's the Garmin Fenix 3 vs Suunto Ambit3 Peak, the features somewhat even each other out. Determining which watch has "better" features is ultimately up to user preference in this case. Both watches are stylish and available in neutral colors that will match with any outfit. While both watches may be bulky and more of a traditional "men's" style, both would look fine on either a male or female user. The Fenix 3 comes in two colors: grey and silver. Each of these options has slight red accents; on the "silver" version, the wristband itself is red. If you like a more neutral accessory, the grey option is probably best. The Ambit3 Peak comes in a basic black model, as well as a "sapphire" model. I use the term "sapphire" loosely because there is nothing really blue on the watch. Both models include a black wrist band, but the "sapphire" model includes a silver outer watch face. The silver face may look slightly blue in some lights. Each watch connects to its own fitness app on the user's phone, and both relevant apps are available for both Android and iOS devices. These apps allow the users to view more detailed data from tracked activities. The apps can also be connected to social media so that users can share activities with friends and family. Because these watches offer so many features and are sure to last a long time, they are quite an investment. Neither watch comes cheap; you can expect to pay anywhere from $300-$500 for either. Both watches are available for purchase directly from the retailer, but customers can typically find these watches at a discounted price through retail websites like ﻿﻿Amazon. While both watches are pricey, the Ambit3 Peak can currently be found at a lower price than the Fenix﻿﻿ 3. The bottom line is that, when it comes to the Garmin Fenix 3 vs Suunto Ambit3 Peak, it is hard to declare a solid winner. Both watches are able to track multiple sports accurately and with impressive battery life. Both are stylish and suitable for men and women alike. There are new versions of both these watches which now have wrist based heart﻿ rate so you no longer need to wear a chest strap to monitor your heart during an activity. What's the difference between Garmin Fenix 3 ﻿and﻿ Fenix 3 Sapphire? Fenix 5 vs Fenix 3 HR - what's the difference?